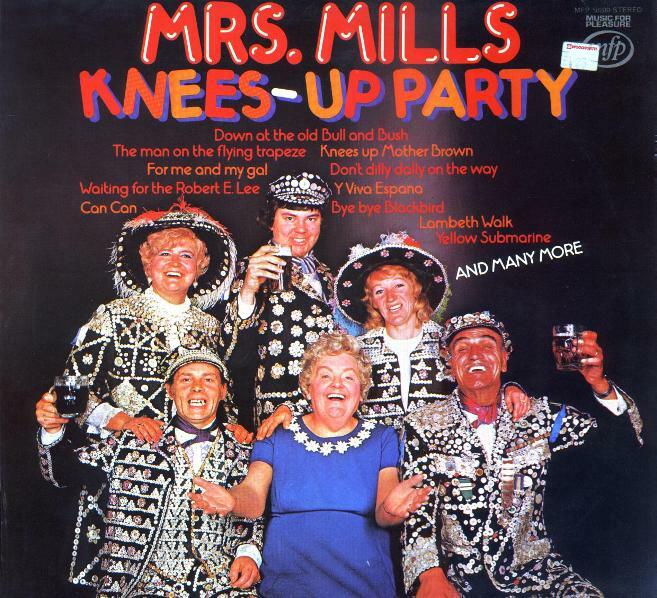 If you ever took the steamer from Tower Bridge to Southend Pier in the good old days you'll know what a 'knees-up' with Gladys Mills is all about. It's Mum, Dad, Auntie Fan and the kids from No. 10 singing their favourite choruses under the wide blue skies. It's the best part of a Saturday night at the local with all the gang around you. It's a get-together extra-ordinary that's got to turn into a whale of a party - simply because Gladys Mills has come along too. A party isn't any sort of a party without our Glad. Half a minute of her gusty lusty piano playing and you're a goner ... a compulsive joiner . . . toes tapping, fingers snapping . . . away on a breezy bouncy journey that gets you singing every step of the way simply because of the come-on-and-be-with-us atmosphere she creates whenever she's around. Gladys Mills has played piano almost as long as she can remember. But it wasn't until she was persuaded to go professional by band-leader Paul Cave who heard her at a golf-club social in the 'Sixties that thousands of present-day party-lovers realised just what they'd been missing all those years. In many ways an evening with our Glad is a today version of the Edwardian musical evening. The warm family social with the gaslamps lit, plenty of beer and sandwiches on the sideboard and everyone doing their favourite thing - like actually making the music themselves! The choruses on this LP are ones that have been hits - it seems - for ever. Some of them rooted way back in the Old Time Music Hall. Others imbued with the nostalgia of war-time togetherness, and some from today that are already becoming the hit-choruses of timeless tomorrows. And so infectious are even the first few bars of Glad and her fans singing away for all they're worth that immediately you, too, feel part of her warm and welcoming circle. Whether you're having your own Saturday night sing-a-long or are at home all alone doing the dusting, you'll find this LP a real rave-up of a knees-up, with songs that have got people smiling and singing together from the turn of the century right up to Beatlemania and the 70's. So don't dilly/dally. Make the most of every moment with this most generous-hearted of party-makers. For if you enjoy a knees-up in the jolly good company of the ebullient Mrs. Mills you'll find you're enjoying the whole world just a little bit more as well!